Hope you are finding these sessions, on Power of Properties, very useful to develop your own business applications. Let us move ahead a mile and learn some new impressive and powerful properties which are not just useful but add a boost to your application. Today we will discuss about Properties of Navigation item. Navigation items are used for your Entities or Reports which provides access points to view different screens of your solution. 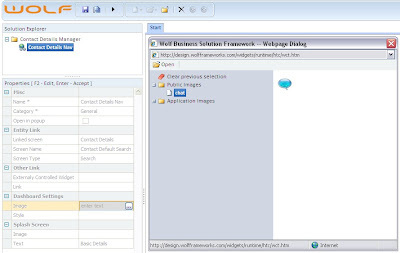 Navigation Items can be configured to link different elements of your application such as Search Templates, Dashboard Widgets, Edit Screens and Reports accessible in the Run environment of the application. Let’s see how Power of Properties can help convert normal navigation to intelligent navigation. Name: Here you can give the name to your navigation item, and it is a mandatory field. Category: As we know that menus help us organize our entities. Similarly the category selection from the dropdown of this property of navigation item helps us organize these menus. This is also a mandatory field to get a proper category for your navigation item. Open in popup: Please select this by marking the check if the menu should open up in a new window or as a tab in the runtime mode. Navigation item more commonly are used to link with the existing entities and report. 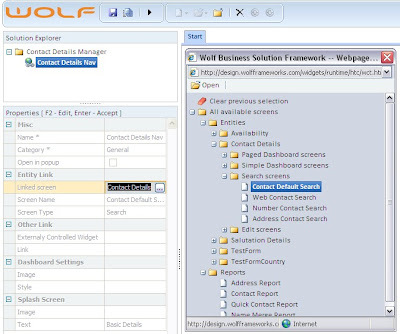 And to link to these elements, Wolf provides the easy way to do this, by just setting a property called ‘Linked Screen’. The properties related to linking with entities are group in a set called ‘Entity Link’. 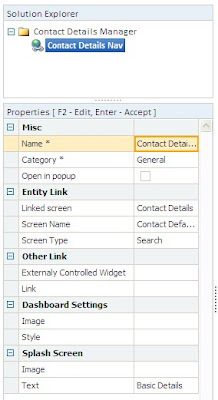 One just needs to set the first property ‘Linked Screen’, the other properties such as ‘Screen Name’ and ‘Screen Type’ will be automatically populated based on the screen selected. Don’t you think, it is the easiest way of configuring navigation of screens? 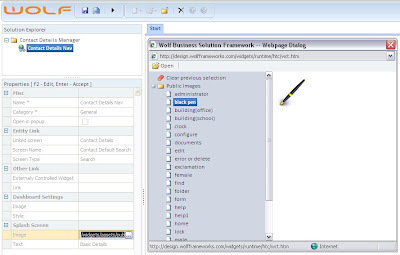 Linked Screen: To link the menu item to a Screen in your application. The Screen Name and Screen Type are automatically populated based on this value. Screen name: It helps us get the name of the search template. This will be automatically populated when you link the menu to an Object's screen. Screen Type: As discussed, it is a read only property that helps you identify the type of screens such as Search, Dashboard, etc. Link: Link to files in the system other than the object related screens. Image in Dash Board Setting: Show the selected image in the dashboard section of the splash screen. The setting will be ignored if the screen type is not a dashboard. We can select the image by following the steps as shown in figure 3.3. Style in Dash Board Setting: A Specific HTML styling that you wish to give to the dash board. Figure 3.4: Image setting of Splash Screen for Navigation Item. Image in Splash Screen: Show the selected image on the splash screen. We can select the image by following the steps as shown in figure 3.4. Text: Leave this blank if you want to use the menu item Name. So friends, try using these properties in your application and enjoy the freedom of developing faster-better-cheaper-steadier applications. In the Next Session, we will go through the most important properties which are basic and more commonly used in all the applications. So get ready for more in next session.